City transportation bureau says North Portsmouth Avenue signage not needed due to low traffic. Stop in the name of the law? Not quite. 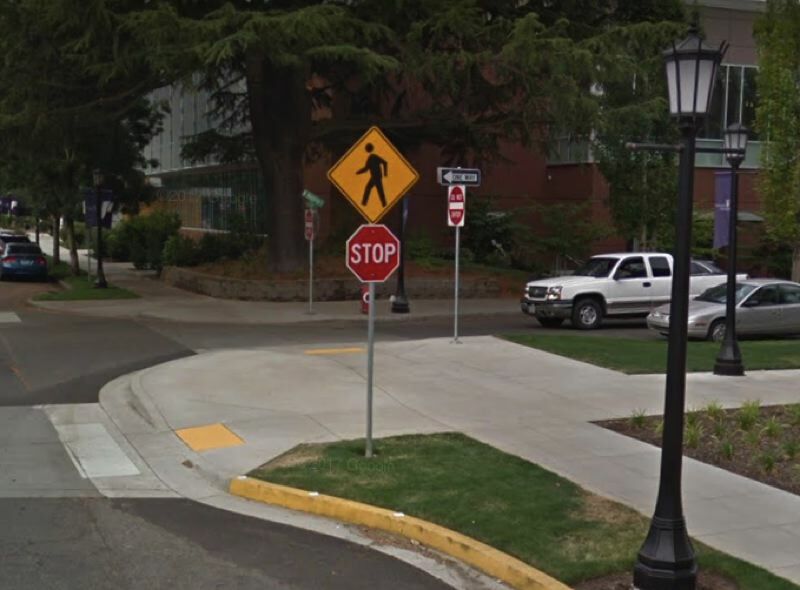 The Portland Bureau of Transportation says a private university broke the law after it installed stop signs around crosswalks without authorization from the city's traffic engineer. City workers removed the four signs from North Portsmouth Avenue in mid March, while students were enjoying Spring Break, and dumped them back in the University of Portland's lap. While some crosswalks in Portland are signalized to halt motor traffic, a city spokesman says stop signs should only be placed at intersections, not crosswalks. "When people driving encounter a stop sign in a place where there's no traffic, they start to ignore it," wrote PBOT spokesman Dylan Rivera. "If someone is in a crash at a place with illegal signage, they could sue the person or entity that installed those illegal signs and win damages." Playing defense, UP argues that the signs protected students crossing Portsmouth — which divides the main campus from the school's Beauchamp Recreation & Wellness Center. "In our experience, the signs did cause traffic to stop, and this particular area on campus is a high-volume pedestrian traffic area," said Rachel Barry-Arquit, director of marketing and communications for the university. "We hope the city will reconsider its decision to remove them." According to a report in The Beacon student newspaper, the University of Portland erected the signs near Strong and Warren streets about a year ago without bothering to apply for permission, because administrators already knew the signs wouldn't meet official criteria. Rivera says town and gown are working together on a plan for the city to relinquish ownership of several side streets, so the university can take over maintenance and other responsibilities. But PBOT will continue to control Portsmouth Avenue in order to ensure access for fire trucks, squad cars and ambulances. Rivera says the bureau follows national traffic engineering standards when determining stop sign placement. "We encourage the university to educate the campus community about safe driving and walking habits, and we would be happy to help with those efforts," he said.